WELCOME TO ZEERA THE SPACE PIRATE! to become a space pirate. Click the button below to read from the beginning! Check out the 2016 Sydney Supanova update! Want more Zeera? Check out the amazingly awesome guest comics! Want to own some Zeera books? Then bless your heart, and click here to go to the shop! Caught up on the archives? Want more Entertainment? Check out the hilarious guest comics, some extra stuff, and the comic links! 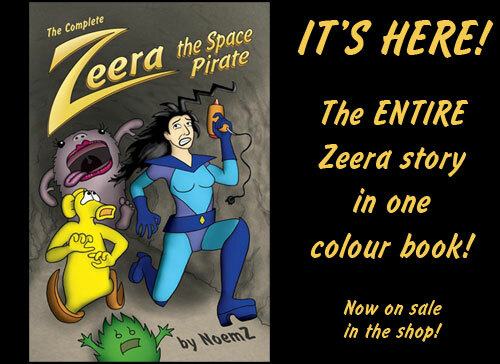 "Zeera the Space Pirate" is Copyright 2001-2013 Naomi Hatchman, and is hosted on Comic Genesis, a free webhosting and site automation service for webcomics.